Stadion De Vijverberg or in English The Pond Hill Stadium is the 12,600 capacity home ground of football team De Graafschap. First opened in 1954, and later renovated in 1970, De De Vijverberg remains to this day as one of the premier football stadiums in the city of Doetinchem. Written history to be added soon. Check Wikipedia in the mean time! Pictures of each stand coming soon. Away fans are housed within sections 13 and 14 of the easternmost part of the south stand, surrounded by home supporters either side. Accessible from the south-west corner where the main stand is (The triangle which sticks out), views of the pitch are generally good but slightly restricted by the support beams. The club shop at De Vijverberg is located next to the main entrance and is usually open for up to one hour before kick-off and one hour after the full time whistle. De Graafschap’s online store is however open 24/7 and is probably an easier way to browse the official merchandise. Tours of the facilities at De Vijverberg stadion are arranged on an individual basis and subsequently don’t follow a set timetable or schedule. The official website advises you to call the stadium manager on (0314) 36 84 50 or alternatively send an email to [email protected] to arrange. 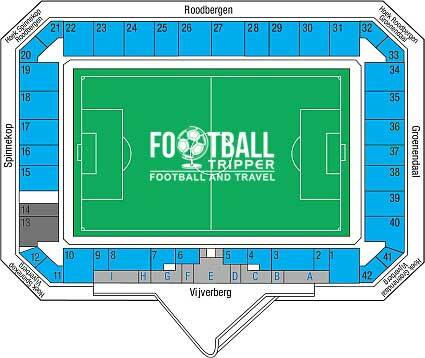 Tickets to see De Graafschap play at home can be purchased through the usual channels including online and in person from the ticket office at the stadion in the days leading up to the match. Please note that for the high-profile fixtures such as the big three and Vitesse and FC Twente, there is a surcharge of €5.00 for all adults and €3.00 for child tickets to offset increased matchday costs and higher levels of demand. De Vijverberg stadium sits 1.7 km south east of Doetinchem’s central area within a picturesque setting overlooking the De Koekendaal nature park. It can be walked to by the average Football Tripper in no more than 20-25 minutes depending on your starting location. There is limited parking available at De Vijverberg on matchdays as there is only one small car park behind the main stand. Doetinchem railway station is even closer to De Vijverberg stadion than Google’s defined city centre with a walk likely to take 15 minutes or so. Alternatively you could also take number 40 in the direction of Dinxperlo which will also take you to the Watertoren. The closest international airport in the Netherlands to the city of Doetinchem is Eindhoven Airport approximately 127 km away. Across the border in Germany Weeze Airport (60 km) and Düsseldorf are technically closer (119 km) however ground transportation may be less convenient. The majority of accommodation options are to be found dotted around Doetinchem including: Stadshotel De Graafschap, Hotel Villa Ruimzicht and Auberge Graaf Hendrik which is slightly further away.